(Fighting Irish of the Civil War/Fag An Bealach) Presented by Irish-American actor Brian Mallon, this two part docudrama tells the dramatic story of one of the greatest units in the American Civil War - The Irish Brigade and its charismatic leader General Thomas Francis Meagher. Fàg An Bealach/Clear The Way - In April 1861 the most destructive conflict in American History, the Civil War, began. Across the American continent, thousands of Irish men and women were caught up in the nationalistic fever that gripped both northern and southern states. 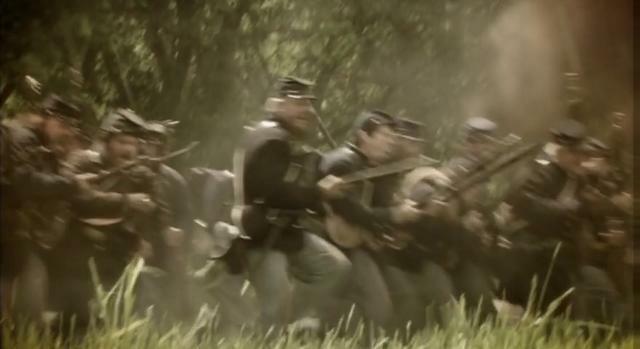 Using forensic evidence, dramatic battle reconstructions and rare archival photographs, this two part series reveals the untold story of one of the greatest military units of the American Civil War: The Irish Brigade. ‘Faugh a ballagh’ meaning ‘Clear the Way’ in old Gaelic, the battle cry of the Irish Brigade, echoed across the bloody battlefields of Virginia, Maryland and Pennsylvania. Here, the legend of the ‘Fighting Irish’ was born. At the centre of the Irish Brigade’s story is its founder, the controversial and charismatic General Thomas Francis Meagher. Meagher, or “Meagher of the Sword”, is the one of the most famous Irishmen in Civil War America. Meagher created the Irish Flag, the tricolour that decades later would fly above the GPO during the 1916 Easter Rising. In 1848 he was sentenced to death for his part in the Young Irelander’s rebellion but, with public pressure, he was instead exiled to Australia. In 1852 he made a daring escape to America, where he was lauded as a hero. Yet he had a dark side, leaving his pregnant wife in Australia and later struggling with alcoholism. Meagher is a hugely colourful, conflicted and enigmatic character. Tile Films cast leading Irish actor Don Wycherley (Rásaí na Gaillimhe; Ondine; Perrier’s Bounty) in the pivotal role of General Thomas Francis Meagher. Fenian, Donegal man James McKay Rorty played by Irish actor Jonathan Byrne(8.5 hours; Primeval) rose through the ranks of the Irish Brigade to become a captain of artillery at Gettysburg. Captured at the famous battle of Bull Run, he makes a bold escape to fight at other epic battles of the Civil War. Irish priest Fr. William Corby played by American actor John Neely (Gettysburg; the speech that saved America) gave up a comfortable teaching post to minister to the men of the Irish Brigade and in the process became the most famous priest in America. He became known as the ‘Fighting Chaplain’ and no spot on the battlefield was too dangerous or too exposed to the fire of the enemy for this priest. Irish-American Peter Welsh, played by Colin D. Farrell (The Ghosts of Duffy’s Cut; Death or Canada) found himself caught up in the tide of war and provided a personal, gripping account of battles such as Fredericksburg, where the Irish Brigade was all but decimated. And New York socialite and Irish Brigade fundraiser Maria Lydig Daly, played by Lesa Thurman (Thor; Gift of the Magi), chronicles life on the home-front. The participation of these Irish people in the war was crucial for the creation of modern Irish-America, as they proved their loyalty to their adopted homeland. Written and directed by IFTA nominated Director Keith Farrell, the series documents the untold story of the brave Irishmen and women who, on arriving in the US seeking a new life, get enveloped by the politics of the North against South divide. The men of the Irish Brigade sacrificed their lives on the bloody battlefields of this epic war and it was here that the legend of the ‘Fighting Irish’ was born. Producer Stephen Rooke spent two years raising the finance to bring these films to the screen. He says “putting co-productions such as this together can be a slow process and you need to strike a balance between the remit of the financiers and the director’s editorial vision for the film. We were delighted when the Smithsonian Channel and TG4 came on board based on Tile Films track record of producing high end international films. Keith’s vision and approach to making the films fitted seamlessly with the ethos of the both broadcasters. We were lucky that when we started developing the project in 2008 we found enthusiastic supporters in David Royle and Chris Hoezl at the Smithsonian Channel and Michael Ó Meallaigh at TG4 in Ireland”.